Every region has its own rivalry that’s existed long before Taylor Swift started talking about teardrops on her guitar – the Yankees and the Red Sox out east, the Giants and the Dodgers out west and the Cubs and Cardinals in the Midwest. There was the chase between Sammy Sosa and Mark McGwire which eventually ended in the Cardinals’ slugger coming out on top. There was Derek Lee and Albert Pujols battling for the MVP award, and once again, the Cardinals’ first baseman came away with the silverware. Chicago has a confident young group led by its ace who humiliated the Pirates with a complete game shut-out in Pittsburgh, oh, and he also stole a base after getting plunked. Rookie Kyle Schwarber played the role of ‘surprise’ in the wild card game, driving in three of the Cubs four runs. And remember how we all gave up on Dexter Fowler’s career not too long ago? He scored three runs and hit a homer for the Cubbies as well. The center of this lineup features two young sluggers in Kris Bryant and Anthony Rizzo, and while general manager Theo Epstein has been around for a while, at 38-years-old, he is still one of the younger executives in professional sports. The Cardinals might not be old by any stretch, but they have a group of guys with a lot of ‘been there done that’ experience when it comes to the postseason. The National League Central Division winners went to the NLCS the last five years and they’re seeking their 20th pennant, while the Cubs are vying for their first pennant since 1945. The heart and soul of this St. Louis ball club is Yadier Molina, a catcher with a strong arm, great bat and big mouth. He picked up an injury in a late-September game with the Cubs and is playing the series with a thumb injury. Molina not being one-hundred percent for the Cardinals hurts the club, but the team has dealt with injuries all year long and that it didn’t stop them from having the best record in baseball. Matt Adams, Matt Holiday, John Jay and Adam Wainwright were all hurt for large chunks of this season, and the team just continued to consistently win. Outfielders Randal Grichuk and Stephen Piscotty stepped in to replace Holiday and Jay, and the two youngsters put up better numbers then the guys they replaced. With Adam Wainwright missing action, Carlos Martinez stepped up to become the dominant hurler in the rotation. He won 14 games before picking up an injury to his shoulder – and he will not be there in the postseason. I can’t help but look at the two teams in this series and wonder how the hell they managed to finish with two of the three best records in baseball. Kyle Schwarber? Stephen Piscotty? Randal Grichuk? Dexter Fowler? Kris Bryant? Jake Arrieta? Carlos Martinez? I can only imagine what would have been said if I went back in time to early April and told people Jake Arrieta will have better numbers than Clayton Kershaw, Madison Bumgarner and Zach Greinke. Or what if I told you on April 2nd that Carlos Martinez would strike out almost 200 hitters this year or that Stephen Piscotty would hit over .300? You would have thought I was nuts. The most disappointing part of this series is that it’s a best-of-five and not a best-of-seven. I know when the series ends I’m going to wish we could have gotten to see just one more heated game between these two rivals. So while ‘smart money’ may be on the Cardinals and their history and experience, I like the Cubs winning this series in five games. I know this Chicago team is young and everyone loves to talk about experience, but I think momentum is a little more important. St. Louis struggled at the end of the season, winning just fifteen games after the calendar flipped to September. The Cubs were able to close ground on both the Cardinals and Pirates as the season hit the final stretch, and even if Jake Arrieta has to pitch on three days’ rest at some point in this series,I mean… it’s still Arrieta. The man has given up 9 runs since August 1st… tough to bet against that guy. The Cubs can also give the ball to a proven playoff veteran in Jon Lester, one of those guys who seems to feed off of a high-pressure atmosphere. I think the biggest fear for Cubs fans has to be their closer Hector Rendon. When the game is on the line, can he be the guy to come in and shut the door? 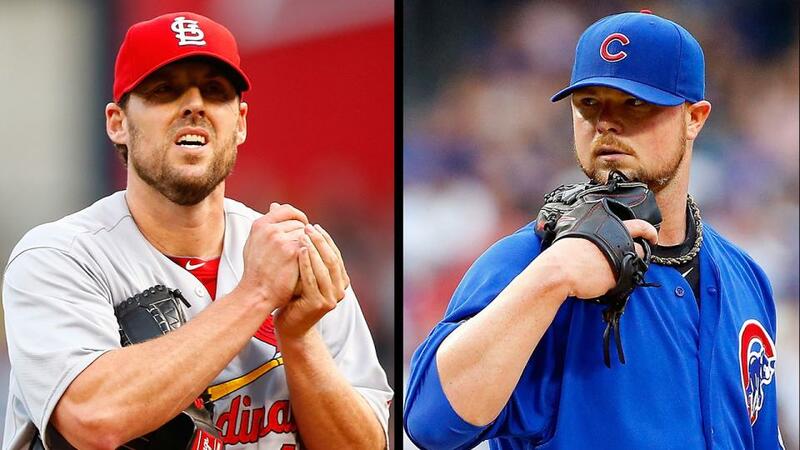 The Cardinals certainly have great arms of their own with Lackey, Wainwright, Wacha and Lynn. But offensively this team struggled all season long, especially in the later months of the year. The Cubs beat the Pirates in the wild card game the same night the Chicago Blackhawks hung up their championship banner. Now the Cubs seem on course to put a banner of their own.